No matter how trivial or huge business one has, the individual needs an error-free assessment and calculation of the money that is involved in the business, because as the world is going online, most of the payments that have been done need to be managed on the web itself. For that analysis, you need a software that can carry out all such finance related tasks and does the payment analytics, the number of transactions that are taking place, the traffic of the customers that are coming in, the bunch of customers that are leaving, all can be seen through the payment analytics software. A collection of all such software that can simplify your payment analytic jobs has been presented here, which contains a number of features like revenue analysis, churn tracking, sales & stats monitoring. Along with payment matrices features, some of these tools also have the funtionality of subscription management for a business. Through it, you will be able to generate limitless revenue while selling products. That’s what everyone would want for their business. So in order to achieve this whole target, all you have to do is to go through this article as many time you want to & finalize the best tool from it. With Pabbly Subscriptions payment analytics system, you can extract complex payment details generated by PayPal Gateway. It delivers different types of reports which can be filtered and refined as per your business needs. 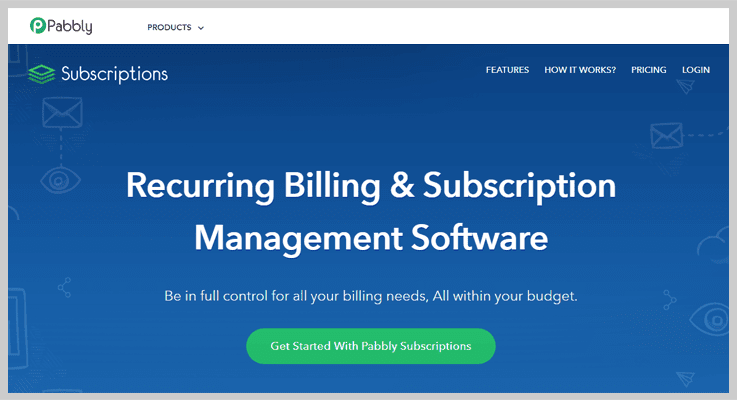 One of the major benefits of Pabbly Subscriptions we discovered is – it’s a combination of both Recurring billing system & Analytics solution. It helps you Analyze Payments, track saas metrics, create products, manage customers, design plans and customize checkout pages. All that at an affordable cost of $5 for monthly usage of full features. Starter:- This plan will allow you using all the features at just $5/m, you can manage 50 customers & setup unlimited products in a few clicks. Rookie:- The Rookie plan charges $29/m for 1000 customers & their unlimited payments. Pro:- For the pro plan, you have to pay $59/m for unlimited customers & subscriptions. Advance:- It costs around $99/m for features like custom domain, affiliate system, dunning emails & so on. Reports for PayPal payment analytics can easily be generated using Pabbly Subscriptions. The reporting feature helps you fetch detailed reports for MRR, Net Revenue, New & Active customers and more. It has a new feature called as custom domain through which you can modify the domain of your checkout page as per your needs. You can manage unlimited customers and create limitless invoices without paying any extra penny. It allows you to collect payments through different payment gateways like PayPal & Stripe. Plus 25+ global currency support are also available. 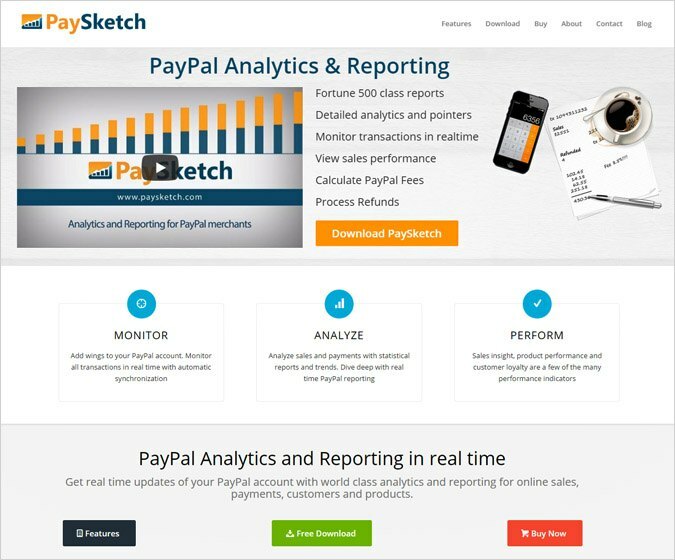 Paysketch is a world-class payment analytic software which gives detailed analytics and monitoring of transactions in real time which help you calculate the PayPal fees and process refunds as well. Standard:- In the standard plan, the user has to pay $7.99 per month for the services, the number of transactions that will be visible is 5000.
Business:- For the case of the business plan, the user has to pay $9.99 per month for the services, the number of transactions that will be visible is 20,000. Professional:- In case of the business plan, the user has to pay $11.99 per month for the services, the number of transactions that will be visible is 50,000. NOTE:- You can also go with their yearly and lifetime plan in which the monthly charges will get reduced in both the plans respectively. Enhance your PayPal account and monitor all transactions in real time with automatic synchronization. You can analyze the cash flow through sales and payments with statistical reports and trends, gauge the purchase of the products done through your business. The user can analyze the progress of your business by looking through the sales insight, product performance, customer loyalty and similar other factors to gauge performance. 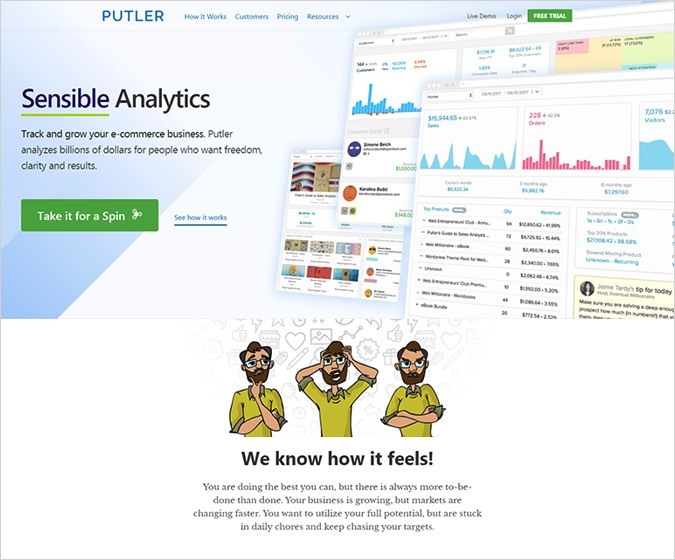 Putler is a one stop solution for all the payment analytics related tasks, the system gives a precise and accurate monitoring of the payments and organizes your orders, products and customers together. Starter:- In the starter plan, you would be required to pay $25 per month, you can have 500 orders per month with 3 integrations. Growth:- In case of the growth plan, you would have to pay $75 per month, including 3000 orders per month with 7 integrations. Scale:- In the scale plan, the user will pay $250 per month, including 10000 orders per month with 20 integrations. You can import multiple sources of e-commerce data like payment gateways, shopping carts, marketplaces and google analytics as well in a single dashboard. The software lets you easily monitor 153+ key performance indicators and reports, recognize macro trends and micro details. You can calculate the average revenue per user (ARPU), churn rate, monthly recurring revenue (MRR), and similar other analytics factors. 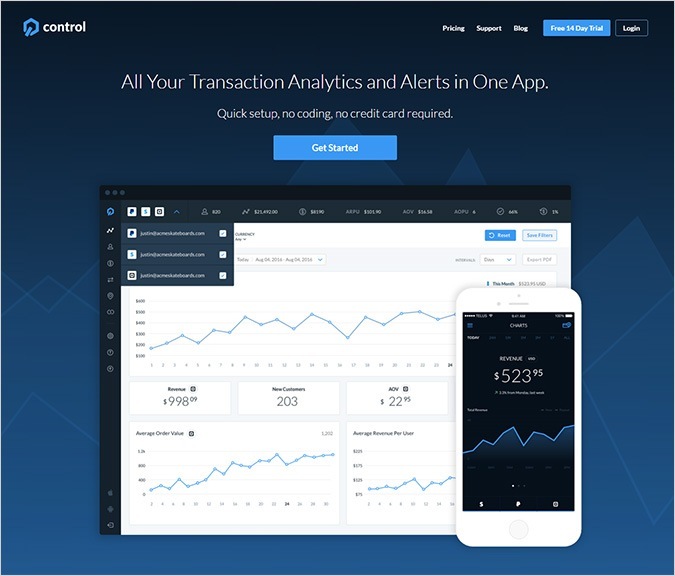 GetControl is awesome software for simplifying your payment analytics task through which you can analyze the trade that has taken place at your end, the software helps you track your key SaaS and Commerce metrics. Starter:- For the starter plan, the user would have to pay $19 per month which is created for small business with $10k or less in sales per month, plus, you can have up to 200 data points per month and $10 per additional 100 data points. Growth:- In growth plan, the user will be required to pay $79 per month which is created for business with $50k or less in sales per month, plus, you can have up to 750 data points per month and $20 per additional 500 data points. Scale:- A per scale plan, the user will be required to pay $149 per month which is created for business with $250k or less in sales per month, plus, you can have up to 10000 data points per month and $30 per additional 5000 data points. Enterprise:- For the starter plan, the user would have to get in touch with the service provider with $250k or more in sales per month. Get a better understanding of the financial workflow by reviewing historical data, and compare business performance over specific date ranges. The user will have real time transaction alerts whenever you get a new customer and any sort of transactions that took place at your business. Have customers insight like the customer history and spending patterns, segregate buyers by country, account age, and total lifetime value. 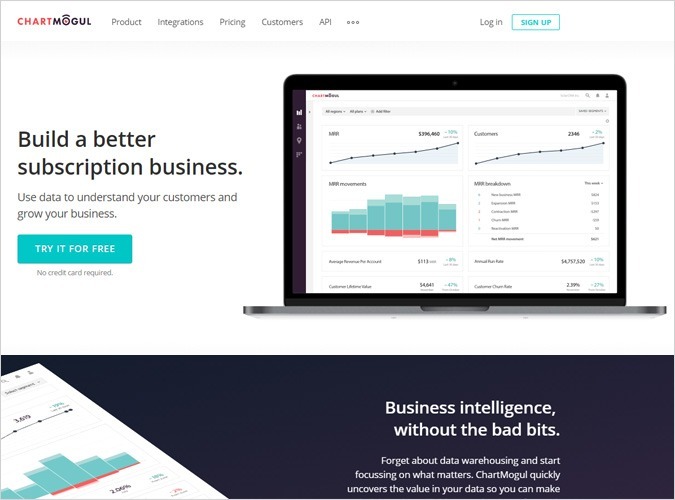 ChartMogul helps you to understand the financial data of your business, how much transaction has taken place, how much traffic have you get at your business and out of them how many conversions have been made, all can be analyzed by the software. Launch:- The launch plan is a free plan, which is limited to $10k MRR (Monthly Recurring Revenue) per month. Mogul:- In case of mogul, the user would have to pay $100 per 1000 paying customers. Volume:- The volume plan is applicable to 10000 to millions of customers, for the pricing of which you have to get in touch with the service provider. ChartMogul easily integrates with your other services like billing, customer support, and more, in addition, a range of turnkey integrations are available as well as a CSV upload tool. The system API allows you to import customer billing data from multiple data sources, apart from that, the data enrichment features allow you to include additional information to your customers in the software. Depict your metrics and insights where your team needs, the software will connect with other platforms and services, leverage context to your team’s daily tasks. 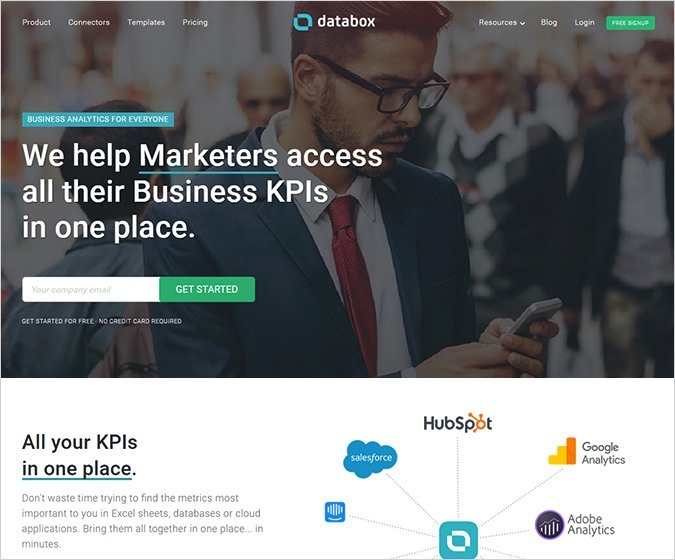 Databox is a leading payment analytic software provider which gives you all the business KPIs at one place, the system also provide the PayPal analytics software which can be used to monitor your balance, sales, fees, refunds and much more. You can also know what are the top products and services that are purchased by your customers. Free:- In the free plan you don’t have to pay anything and there will be 3 data connections, 3 Users, 3 data boards available. Basic:- In the basic plan you have to pay $49 and there will be 10 data connections, 5 Users, 10 data boards available. Business:- In the business plan you have to pay $249 and there will be 50 data connections, 20 Users, 50 data boards available. Custom:- In the custom plan you have to contact the service providers and there will be unlimited data connections, unlimited users, unlimited data boards available. The net or total sales of the last 30 days can be seen and tracked and you can track them as well from the previous records and data. The above-mentioned services are the exclusive ones that have been chosen for you so that all your payment analytic needs can be handled effectively and you do not face any troubles or complications in managing transactions in your business. The software will help you organize your financial data and will let synchronize your work by accumulating all the scattered stuff at one place. The software will give you the analytics of the trade that has been done. Apart from this, if you wish to have a mechanism to market yourself on the web then email marketing would be a great way to merchandise yourself, for that, an email marketing software is required and one of the most reliable is the MailGet Bolt. The software will help send emails in bulk to a number of people at the same time, there are multiple features which are inbuilt in the software that will enable you to create and customize your email templates, which you can also use it as an auto-follow up email or simple marketing mail.